You could add any different combination of vegetables, herbs and sausage here based on your family's likes and what you have on hand. I usually just search through the fridge and pantry and see what needs to be used up and then toss it all in the roasting pan. See the directions for alternate ideas. 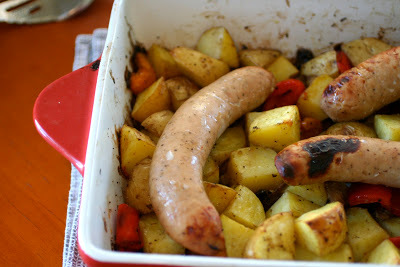 In a large roasting pan, add the potatoes and whatever vegetables you are choosing to use. Add the garlic, oil and herb or seasoning and toss to coat. Place in the oven and roast for 25-30 minutes. Remove from oven and place the sausages on top of the veggies. Drizzle with a little bit of oil and place in the oven for 20-25 minutes until the sausages are cooked. anything you have in your cupboard!